Dr Brian Gill, Dr Michael Anderson and Dr Luis Ortiz-Catedral holding specimens of the Yellowhead and Whitehead from the Auckland War Memorial Museum collection. New Zealand's unique biodiversity has been strengthened with the identification of a new endemic songbird family—the family Mohouidae—which includes the endangered Yellowhead, the Whitehead and the Brown Creeper. This brings the number of endemic songbird (Passeriformes) families to five and increases the number of endemic vertebrate families from 13 to 14 (11 bird, 1 frog, 1 bat, 1 tuatara). 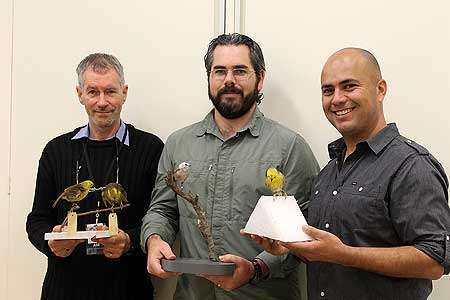 It's an achievement that Massey University postdoctoral fellows Dr Luis Ortiz-Catedral and Dr Michael Anderson say has international significance, as the taxonomy of birds, especially Australasian songbirds, is the subject of intense research. 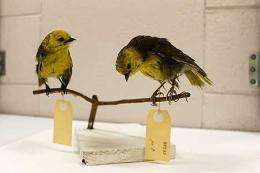 By conducting DNA sequencing of three species—two of them for the first time—the testing confirmed what had been suspected since the 1950s. "Mohoua were clumped in the same genus for some time," says Dr Ortiz-Catedral. "But this was done without more stringent evidence. By obtaining DNA samples from all three species of these birds, we were able to add to the body of knowledge about New Zealand's unique biodiversity." The Whitehead (Mohoua albicilla) or P?pokotea is only found in native and exotic forests in the North Island, while the Yellowhead (Mohoua ochrocephala) or M?hua and the Brown Creeper (Mohoua novaseelandiae) or P?pipi are only found in the South and Stewart Islands. Dr Anderson says despite the differences in location, the Whiteheads and Yellowheads are more closely related to each other than the Brown Creepers. The project to identify New Zealand's fifth endemic songbird family was a global collaboration between New Zealand, Australian and United States-based scientists, and came about while Dr Anderson was conducting comparative analyses on New Zealand cuckoos. The Yellowhead (Mohoua ochrocephala) or Mōhua from the Auckland War Memorial Museum collection. "We know very little about the Long-tailed Cuckoo, which parasitises these three species, laying its eggs in their nests," he says. "This research will help us to understand the evolutionary relationship between this brood parasite and its host species." Notoriously difficult to obtain samples from, the team recruited several New Zealand-based scientists to obtain a variety of samples from a number of species while in the field to get a robust database from which to draw their evidence. "It would be inaccurate to only sample these three," says Dr Ortiz-Catedral. "We needed to find out how they would be placed when compared to other species from New Zealand and the broader Australasian region. When more species were added to the analysis, these three really came into their own." Professor Mark Hauber, a New Zealander now based at Hunter College of City University of New York became the conduit for the DNA sequencing, analysed by lead researcher Zachary Aidala in New York. Previously working in Auckland (and Dr Anderson's and Dr Ortiz-Catedral's PhD co-advisor) Dr Hauber is a leading researcher in animal behaviour and conservation ecology in the Department of Psychology at Hunter College. As one of the last land masses to be settled by humans, New Zealand occupies a unique place in the world as a living conservation laboratory providing valuable training for scientists saving endangered species. Dr Ortiz-Catedral says the world-class methods developed here involving the analysis of complex data sets is one of New Zealand's finest unsung export stories. Originally from Mexico, Dr Ortiz-Catedral came to New Zealand to study New Zealand's conservation methods and went on to complete his PhD on refining translocation practices for New Zealand native parakeets. His expertise is now in demand globally and he recently came back from the Galapagos Islands working on a project to save the critically endangered Floreana Mockingbird (known as Darwin's muse). The Whitehead (Mohoua albicilla) or Pōpokotea from the Auckland War Memorial Museum collection. 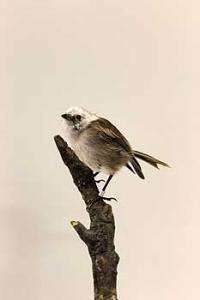 Auckland Museum taxonomist Dr Brian Gill investigated what name could be applied to the new family and found that "Mohouidae" was available from its published usage in 1946 by Gregory Mathews. Dr Anderson says the international collaboration can help unravel how far back in time these native birds have diverged from their ancestors and how fast they have evolved into different species. Data from this project will help to inform comparative studies both locally and internationally. "It's an exciting discovery that further enhances the level of uniqueness of New Zealand's biodiversity by increasing our high levels of endemism," says Dr Ortiz-Catedral. "It's much easier to prevent biodiversity loss by maximising conservation efforts early." The discovery was published in the prestigious Journal of Ornithology.